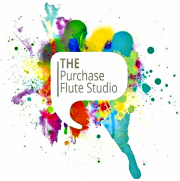 The Purchase Conservatory of Music Flute studio is comprised of a small diverse and intimate group of talented students studying at the undergraduate and graduate level. Purchase College offers one undergraduate degree: a Bachelor of Music in flute performance, and a three graduate degrees: a Master of Music, Artist Diploma, and Performers Certificate. All students receive weekly private lessons and participate, by audition in the Purchase Symphony Orchestra lead by Maestro Ransom Wilson. The symphony presents 6-8 orchestral concerts, and an opera each year. In addition to the orchestral experience, each student performs in chamber music ensembles each semester, which are coached once a week by a member of our esteemed faculty. Students are also given the opportunity to play in Camerata directed by Dr. Bradley Brookshire, Contemporary Ensemble, directed by Professor Dominic Donato and work with young and emerging composers in the Purchase New Music program. Our flutists give recitals and perform in ensembles and master classes given by visiting artists throughout the year. There is also extensive, in-depth work in ear training, music theory, music history, and at the undergraduate level, a required component of liberal arts general education. The Purchase Conservatory of Music prides itself on its supportive, collegial atmosphere and its detailed attention to the progress and development of each student in a diverse environment. Located just 35 minutes from New York City, the Purchase College campus is situated in the peaceful atmosphere of Westchester County. Steps outside the doors of the Music Building is the college’s Performing Arts Center, which has an extensive concert season featuring the world’s most renowned artists as well as our own Purchase Symphony Orchestra. Many of these artists give master classes and open rehearsals for our students in the Conservatory.